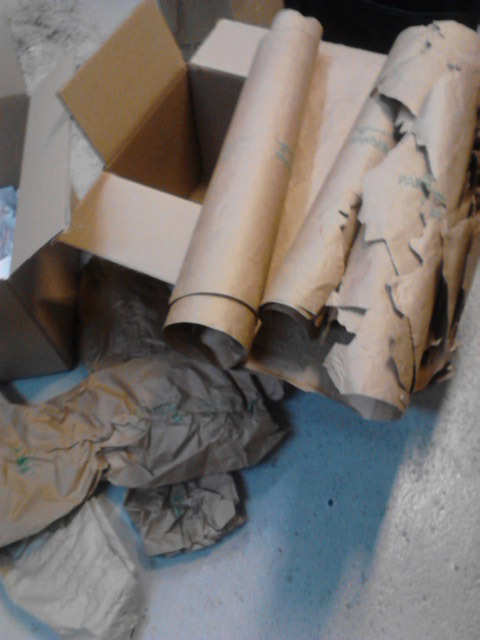 Collect pieces of packing paper; these were approximately 24″ x 36″. Cut each piece in half like a hot dog bun, then use a wooden yardstick to help roll the paper. 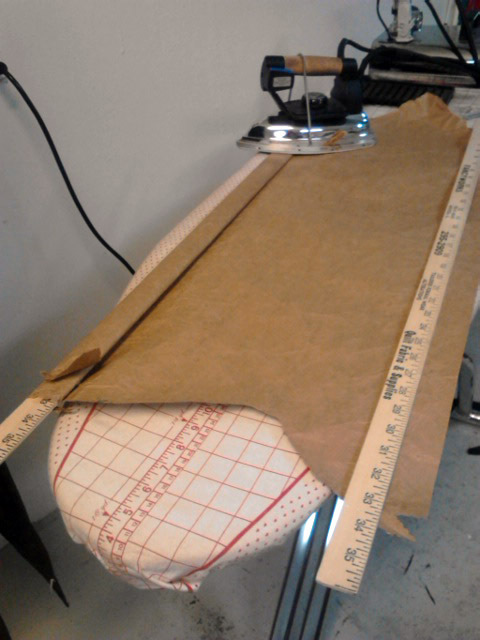 The yardstick works as a measuring guide and a pressing jig. Once pressed, slide the yardstick out of the tube. My BERNINA 8 Series machine had no problem stitching through nearly 8 layers of paper. [ed. Most other BERNINA models can stitch through this much paper, too. It’s that DC motor and precision metal parts that give the machine the strength to stitch through all those layers.] Because of the rigid nature of the strips, sure there is clear space behind the machine to accommodate the strip as it passes through the machine. I also increased the presser foot pressure for extra control. I used the sliding guide attached to the slide-on table as a guide. 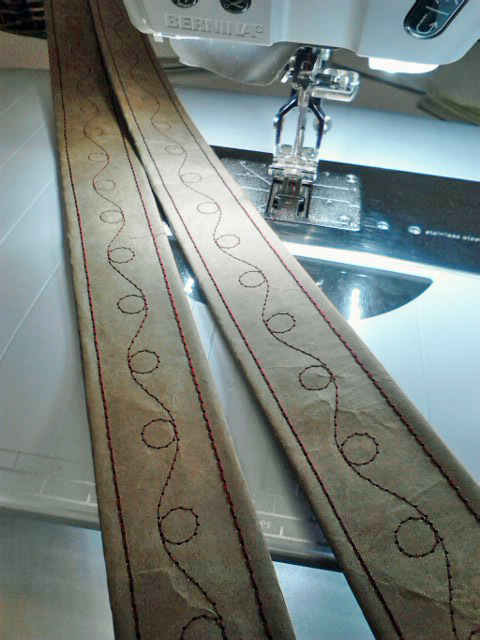 I used Reverse Pattern Foot with Dual Feed #1D, with the needle position in the far right, for the stitching along the strip edges. I then chose a simple decorative stitch – duplicated and mirrored – to embellish the center of each strip. 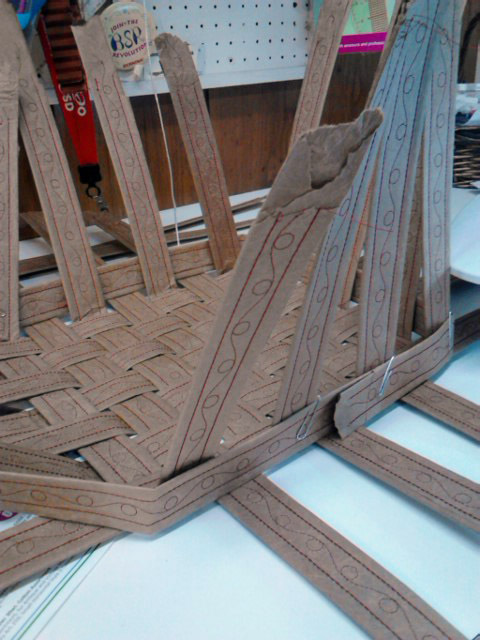 For the weaving, I used clothes pins to help hold the strips in place, and only used glue in a few spots to keep some of the ends in place. 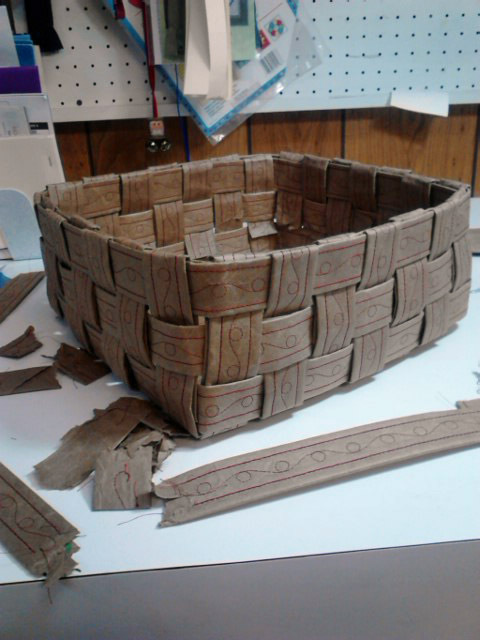 To finish the top edge, I placed a second strip inside the top horizontal round with the vertical strip ends woven over and then tucked into a lower horizontal round. This is so great and creative. What size/type of needle did you use? What kind of thread – it looks to be a bit heavier weight. I love the stitch in the middle! it’s brilliant. What machine are you sewing on?